Pennsylvania Power of Attorney Forms is a type of legal document that allows someone to appoint another as a stand-in. This type of appointment usually comes into play when someone must be available or physically present to make certain decisions and cannot be. An appointee of such paperwork will be able to make decisions (and take action) on your behalf in many areas of life provided legal and written approval of such behaviors has been documented. This can be quite useful. You make decisions every day that affect different aspects of your life, including health care decisions, what you are going to spend money on, whether your child can go on a field trip or not. Now imagine that you are not around or are otherwise unable to make these important everyday decisions. A POA can allow you to plan for such an eventuality by allowing you to legally appoint another to make those decisions for you. Durable Power of Attorney – Using this form, a person may plan to have a friend or relative available to make financial decisions on his or her behalf. This form can go into effect upon a person’s incapacity and it will remain in effect thereafter. Signing Requirements (§ 5601(b)): Notary public and two (2) witnesses. General Power of Attorney – Using this form a person may appoint a friend or relative to handle his or her financial affairs, however, unlike the durable type, it becomes void if the person creating the document becomes incapacitated. Limited Power of Attorney – Using his form, a person who needs someone for a short-term or limited assignment, can appoint someone to stand in their place, just for that one assignment. Health Care Power of Attorney – Using this form a person can appoint another to work with their health care providers to make medical decisions on their behalf in the event they are unable to do so. Signing Requirements (§ 5452 and § 5471): Two (2) witnesses (notarization is recommended). Minor Child Power of Attorney – Using this form, a person can convey authority to another to be the temporary caretaker of their minor child(ren) and make decisions on the children’s behalf. Signing Requirements: Not specifically mentioned. 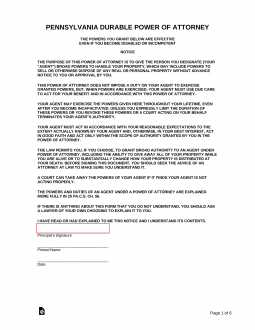 Revocation of Power of Attorney – Using this form, you can revoke a power of attorney that you may have signed in the past. Tax Power of Attorney Form – Using this you can appoint another, usually a tax professional, to handle tax filings and other matters in front of the Pennsylvania Department of Revenue. Signing Requirements: Principal only, unless the representative is not an attorney, certified accountant or enrolled agent, in which case two (2) witnesses or a notary public must acknowledge signature. Vehicle Power of Attorney – Using this form, a person can appoint another to handle matters with the Department of Transportation in Pennsylvania as it relates to titling and registering vehicles.